The Learning Commons and its partners offer a variety of workshops to help students with their academic work and career planning. Check out the calendar for an up-to-date schedule of offerings. Below are examples of popular workshops. Library Research Skills Workshops for Graduate Students – available in January [24 and 31]. Graduate students in the social sciences or humanities are invited to attend a free, library research skills workshop. Participants in this hands-on session will practice finding scholarly journal articles, monographs, government publications, data/statistics, images, and more on a given topic; citing sources; and organizing references and printing bibliographies automatically using a citation manager (Zotero). This session is useful for graduate course work, literature reviews, and thesis work. No registration necessary. Everyone is welcome. 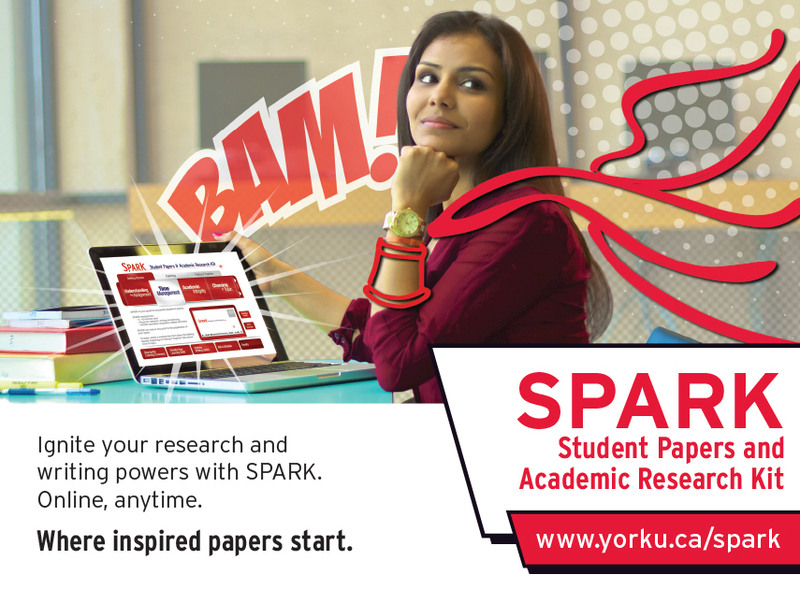 Attend this short orientation to York University Libraries to learn how the library can help you with your academic studies. We will provide an overview of the libraries, how to navigate the library website to find books & articles, where to get research help, book group study rooms and more! Invest some time with us now to be more efficient during the school year. Learn how to find scholarly books and articles more efficiently than Google! We will be navigating the library catalogue and article databases in this hands-on workshop. Frustrated with citations? Take this workshop to learn how to cite properly. We will explore tools and offer tips to make citations less of a chore! This session will help you get a good start on your essays. Learn how to develop an effective thesis statement that tells the reader where you are headed. What is the purpose of an introduction? What should you put in your conclusion? How can you use evidence to effectively support your arguments? What does your TA mean when she says your thesis is “unclear”? What does a “clear” thesis look like? This workshop will cover common questions such as these to help demystify the academic writing process. Do you lose precious essay marks due to grammatical and stylistic errors? Learn to analyze your work logically and systematically to improve the quality of all your academic assignments. You will learn to assess content, correct common errors and proofread for accuracy. This is a hands-on workshop, so if you have a writing sample, bring it to the session and be ready to use what you learn right away. Where does the time go? Are you having trouble balancing school, work and life? How much study time is enough? Learn practical, personalized approaches to managing your time that work for you. Multiple choice, short answer, calculations or essay style – which exam format is your personal nemesis? Whatever the format, and whether it’s midterms or finals, if you could use some help in preparing for exams then this workshop is for you. Many students find keeping up with the readings and lecture notes at university to be a real challenge. Learn more effective reading and note-taking techniques to help you stay on top of your course work. Getting Started: What Can I Do With My Degree? Are you wondering how your degree may relate to your career direction? This introductory workshop provides an overview of career exploration and is an important starting point for Career Exploration workshops. Learn how the skills you are developing in your degree and the experiences you are gaining help build a foundation for your future. Identify resources for exploring possible career options. Choosing where to continue your education is a critical element in ensuring it is a positive step forward. Learn about resources and strategies for selecting a post graduate program that fits best with your expectations, interests and resources. Learn about common elements required in many application packages and get tips on how to make sure yours is as competitive as possible. Trying to figure out how to allocate study time in your busy schedule? Need help with picking out the most important aspects of your readings? Want to break your workload down into smaller, manageable tasks? Need tips on how to prepare for upcoming quizzes and exams? Visit us at the Welcome Desk (Scott Library, 2nd Floor), to get quick study tips from a Learning Skills Peer every Tuesday from 11:00am-1:00pm & Thursdays from 12:00pm-3:00pm.